High capacity transfer carts aren’t made for the small jobs. They’re specifically designed to safely handle larger and/or heavier loads that go beyond the capacity of traditional motorized platform carts. These custom carts may transport between 5,000 and 40,000 pounds of material at a time with dimensions extending to 15’ or more. Such loads predictably present greater logistical problems and heighten injury risk, which is why wirelessly controlled transfer carts are necessary for certain high-capacity material handling operations. Here’s what you need to know about when to go wireless. Some of the worst material handling disasters result from the attempted transport of exceptionally large loads with inferior equipment or poor transport strategies. Heavy-laden forklifts crashing into walls, shelving, or other equipment are not uncommon in material handling and manufacturing operations when drivers are unable to adequately see the pathways in front of them and avoid obstacles, or when existing equipment lacks enough maneuverability for a given workspace. The results can include injury, property damage, and a major disruption to workflow. So how does wireless operation address these types of issues? Unlike equipment that requires a driver sitting or walking close to the material load, an operator of a wireless transfer cart can stand a safe distance away from the cart and move around as necessary in order to fully view the pathway ahead, to the sides, or behind. Fewer blind spots result in fewer preventable collisions and other accidents. Additionally, a wireless transfer cart can be designed to rotate around its center, making it ideal for tighter workspaces and pathways where making turns with a loaded forklift simply wouldn’t be possible. Furthermore, in the unlikely event of a collision involving a transfer cart with wireless control, an operator standing a safe distance away won’t be trapped or wedged behind it. These are the most serious types of transport disasters wireless control transfer carts are designed to prevent, but the applications for their use are broader than collision prevention alone. Wireless transfer carts can also enhance logistical functioning and address material transport problems where employee movement is prohibited or restricted. In addition to preventing collisions, wireless transfer carts also allow for the transport of materials in workspaces where employees cannot fit or are not permitted. A driver can instead stand a safe distance away, while the cart moves either independently or along a track to transport necessary materials. When the workspace is clear of obstructions, the entire material handling process is expedited, because the operator can drive the cart from anywhere in the space without having to take unnecessary steps to bring the transfer cart back and forth between the operator’s workstation and the cart’s destination. As a result, loading, transport, and unloading becomes a seamless process that prevents excessive running around and potential mishaps and collisions that can happen with so many employees moving across a workspace. Like other types of motorized carts, wireless control transfer carts also eliminate the push/pull forces that cause musculoskeletal disorders (MSDs), which are responsible for the majority of workplace disability cases. Transfer carts carry some of the heaviest loads, making it imperative that they be designed to protect employees from MSDs given the substantial opportunity for injury. 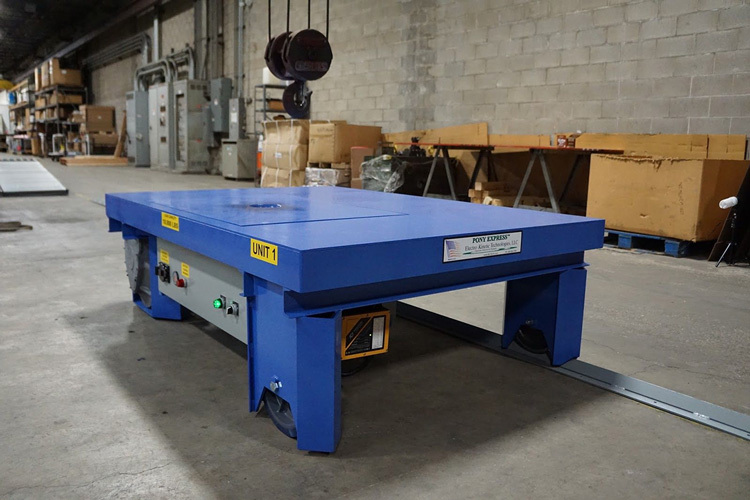 With custom additions like safety lighting, racks, and different platform sizes and payload specifications, wireless control transfer carts are both safe and versatile material handling solutions for high-capacity load-bearing applications. For more information on wireless control transfer carts, connect with one of our engineers via the Contact page on our website.